Just months after its release, the 5oz Silver Coin issued by The Royal Mint to mark the Queen’s Diamond Jubilee has officially sold out. It will now join an impressive list of sell-out coins from around the world struck in celebration of Her Majesty’s sixty year reign. News of its sell-out may however not come as too much of a surprise to collectors. The Diamond Jubilee 5oz Silver Proof Coin was issued with a worldwide mintage of just 1,952 – the year of the Queen’s accession – so demand to own one of the coveted coins has been high. Plus, while the 5oz is an established and respected format elsewhere, it’s only the second 5oz silver coin ever minted in the UK. The first UK coin in the 5oz format was also struck by The Royal Mint this year and marked the London 2012 Olympic and Paralympic Games. A significant number of Diamond Jubilee coins issued by mints around the world have now completely sold out – several within a very short space of time. The Queen’s popularity and the rarity of the Diamond Jubilee have undoubtedly also added to worldwide demand. 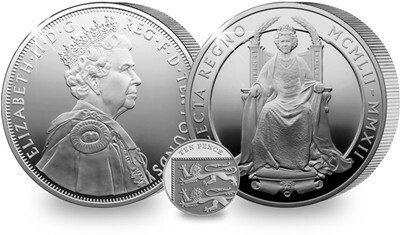 The Diamond Jubilee 5oz Silver Proof Coin boasts a full 5 ounces of 999/1000 silver and an immaculate proof finish. The coin was designed by Ian Rank-Broadley FRBS. It would be a wonderful idea, I think, for the Royal Family to lead the world in issuing a sovereign to promote peace around the world. We ;have seen how popular the royals have been in this past year and it would be appropriate to follow this attitude of “togetherness” in the world.